One of those days? Possibly. The odd team selection didn’t help, in my opinion. Not only did we unnecessarily change a team that won well last week, but we ended up with a left-back looking ridiculously uncomfortable at right-back, and a central midfielder who clearly wasn’t match-sharp and who, as a result, was lacking in virtually every area of his game. 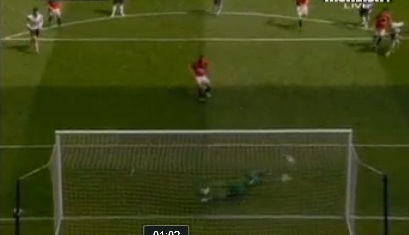 Berbatov has the ball wide on the left for United, and beats Assou-Ekotto with ease. Despite his attempts to pull him back (if you’re going to do it, do it properly! 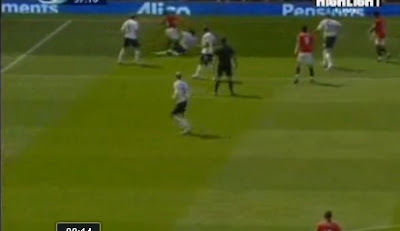 ), Berbatov gets away, and wanders into the danger area. 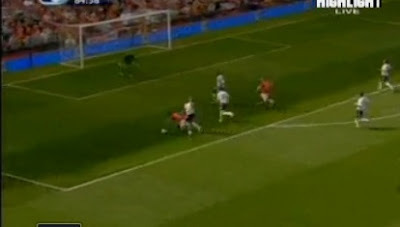 Dawson holds him up, but Berbatov shows great awareness to play a back-heel perfectly into Evra’s path. I can’t explain this. A rash tackle in the box with his wrong foot – I’d ask what he was thinking, but I think the issue is more that he wasn’t. The referee’s view is partially obscured by Palacios, but it’s not a difficult decision to make. Gomes goes the right way, and gets painfully close to keeping it out. Absolute suicide, having looked relatively solid for nearly an hour. It’s 1-1 at Old Trafford, with only 10 minutes to go. Just keep it tight. 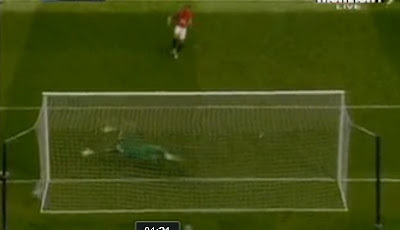 In fairness, it’s a slick move from United, but we could certainly defend it better. Fletcher has the ball wide on the left. We’re relatively well-set to defend, although Assou-Ekotto (now back over on the left), has got himself caught higher up the pitch than Bale. You can see from this angle that Bale is the deepest player on the left, with Crouch and Assou-Ekotto ahead of him. Macheda has dropped off, and neither our centre backs nor central midfielders have decided to deal with him. Fletcher fizzes a ball in to Macheda’s feet. His first touch is good, and the movement off the ball means that he has an excellent option. 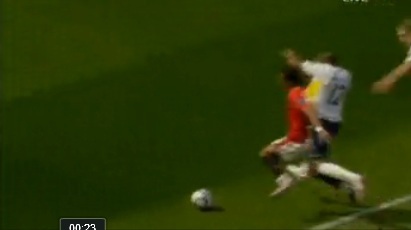 Crouch, Modric and Assou-Ekotto are now out of the game if United are quick about it. Bale hasn’t tucked round nearly enough at this point. King is caught between a rock and a hard place. Does he go to Macheda, or does he mark Nani? Unfortunately, if Bale had been switched on, it wouldn’t be an issue but, as it is, King is left with a real job on his hands. Nani is quick, but he also has the advantage of a head-start when Macheda plays the ball into him. Nani gets way from King easily on the turn and, with Bale no longer in the picture, he’s left with a great chance. How about the finish though? Quite exquisite. 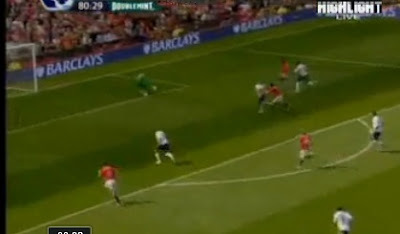 Nani picks the ball up and, with no options, drives at Dawson. He turns Dawson inside and out, but with Palacios back on the cover, it looks as though we should be able to see the move out. Nani’s forced wider than he’d have liked by Dawson, so it’s just a case of standing up and either getting the ball out for a corner, or waiting for him to try to force something. 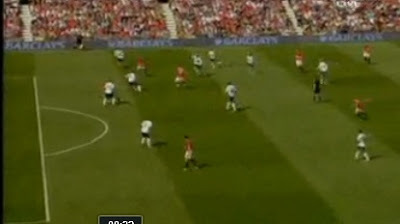 Instead, Palacios tries to go through Nani to get the ball, putting his hands on his back. 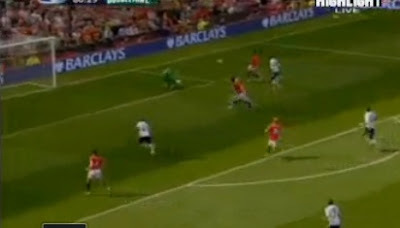 Nani’s not stupid – he is going wide, so he is happy to slow up and wait for the contact. 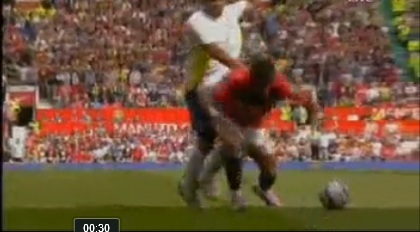 Nani feels the contact, and goes down. Again, not a difficult decision for the referee, but a ludicrously soft penalty to give away. Gomes goes the right way again but, like the first, Giggs puts it far enough in the corner, and with enough power to get it beyond him. More a case of daft defending by BAE and Wilson, methinks. Granted they were played out of position but both still conceded unnecessarily. One other point of note: it seems that when Crouchie (or any other of the forwards) drops extra deep to defend, it brings on a mild case of uncertainty and ball watching from our defenders/midfielders who would otherwise be taking decisive action. Suicidal defending for both pens. The mistake was shuffling the team to accommodate Wilson who had a very poor game all round. If we had stuck with the winning formula of Modric and Huddlestone in the middle, with Bale left-mid and Kaboul at right-back, things may have been different. Much as I think Wilson, is what we have needed for a long time, his distribution is shocking and he got caught in possession too many times. i thoroughly agree with the comment about not changing a winning team and i believe H got it badly wrong here. In the 2 previous games we had an attacking bale as our most dangerous option here he was restricted by having to defend. Bae was great at LB too and modders with hud looked very promising. why lose all that just cos kaboul may not deal with nani? Harry is good at getting the best out of players, but his tactical skills are not so good. Why change a team that beat Chelsea and Arsenal, just because the alleged "stronger players were available. In this case to accomodate Palicious he played Ekotto. Both players are always in danger of giving penaties away. Agree with previous comments should have stayed with same team (King excepting). Harry also took a long time to realise playing Crouch was bad news as the team reverted to long ball. Could have been Champions this year Harry without beating the top four. Wolves, stoke etc etc. i forgot king was available and harry must play him whenever he can. I do feel a bit sorry for basson here though. 1. Bentley is unsuitable for games where you are trying to sit back and hit someone on a quick counter attack. He is more solid defensively than our other options, but far too slow going forward on the counter. He only really looks good in games where we are dominating possession, or if the opponents have a weak left-back. 2. Pav is great to get a goal away to teams on Wigan on bad pitch in a scrappy game. For a set-up like yesterday, he's too slow and his control is good enough. Against the top teams an optimistic shot from distance is the best you can expect. It is not about who were picked to play. Mistakes are bound to happen and I don't blame Sgt Wilson or BAE for the 2 pens. Most of the comments are about these two poor fellas who are "picked" to play out of position which resulted in those 2 pens. The real concern is why our strikers are not scoring? 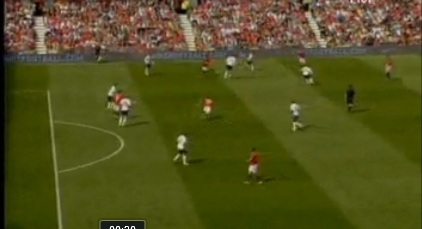 The other is, why Arry took out Defoe and Super Pav that early? Isn't it stupid...when we are suppose to get goals, Arry brought on the stiff beanpole and Gudjhonssen.IMO, these two will only be good when we are winning, where Gude to hold the ball and delay the flow of the game and the beanpole....he can waste the ball up top (guess that is all he is good at...! ).Wonder why Arry just can't think of it...Helloooo! We were playing against MU!! Yet this kind of stupid mistake is being done over and over again. On the overall, we didn't play the way we should, we could have scalp them (MU) as we did d'Arse and Chelski. On the 2nd goal, Bale was ball-watching, King can't turn as fast and Gomes went down a bit too early. Dawson didn't give his 100%, Bale looked tired, Bentley was poor (can't even cope the sick Evra...), Hudd seemed lost in the middle, Modric worked hard but got shut fast, Defoe was quite, Pav...no luck... Hope we all learned a good lesson and next, mauling of Bolton!!! COYS!! To Anonymous at 16:43 - in fairness to Redknapp, Defoe has 4 league goals in 2010. The best bit of link-up he and Pavlyuchenko showed yesterday was when the ball bounced awkwardly off Defoe to Pavlyuchenko, who shinned it wide. I can see why he played Palacios as he and Huddlestone have been a successful midfield pairing all season. Palacios was not injured and should have not have been too far off the pace. The decision to play Ekotto at right back was the key error because he played there against Sunderland, I think, and looked out of position. But really individual errors can occur at any time and there is no guarrantee that other formations would have been better on the day. We played poorly as ateam apart from Gome,Ledley and Dawson. Bentley was very poor as was Defoe but how is Harry supposed to know that before the game. Broadly agree with Windy's analysis of the second/third goals - but Bentley needs to take some share of the blame for the first penalty. 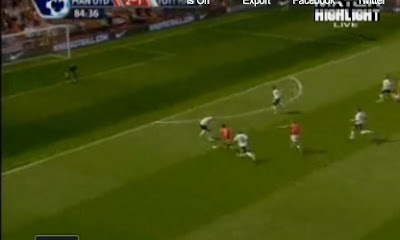 When Berbatov picked up the ball, Bentley was goal-side of Evra - but let him run past him and this made the opening for Berbatov's back-heel and Assou-Ekotto's desperate lunge followed. Agreed with J, and Arry wouldn't know what could happened before the game, but on the other hand I guess that's the reason why there is a term called "calculated risk". Arry knew days before the game that Azza would be brought on in the last 20 mins. Knowing Azza, he'll cross the ball at full speed hence, fast and nippy striker like Defoe or a striker who's clever in running into space like Pav are really needed. Crouchie is too slow, his headings are sloppy & terrible, his first touches are sorry and despite being the tallest, he's more often than not, got outjumped just by anyone...LOOSE him pls! !